You might have noticed (us Brits do tend to stay pretty quiet and non-hysterical about such things) but it’s been PRETTY HOT in London this week. Like, the hottest it’s been for a decade, hotter than Barbados, trains melting off their tracks, etc. Turns out my wardrobe was quite unprepared for this. 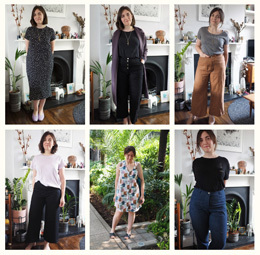 When I did my Konmari clear-out I threw out a lot of strictly summery clothing since it’s barely ever hot enough here and I don’t go on enough tropical holidays to justify them. 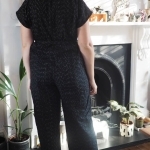 But then a heatwave happens where wearing anything remotely heavy or close-fitting isn’t an option, and after wearing both my Alders I was a bit stuck. 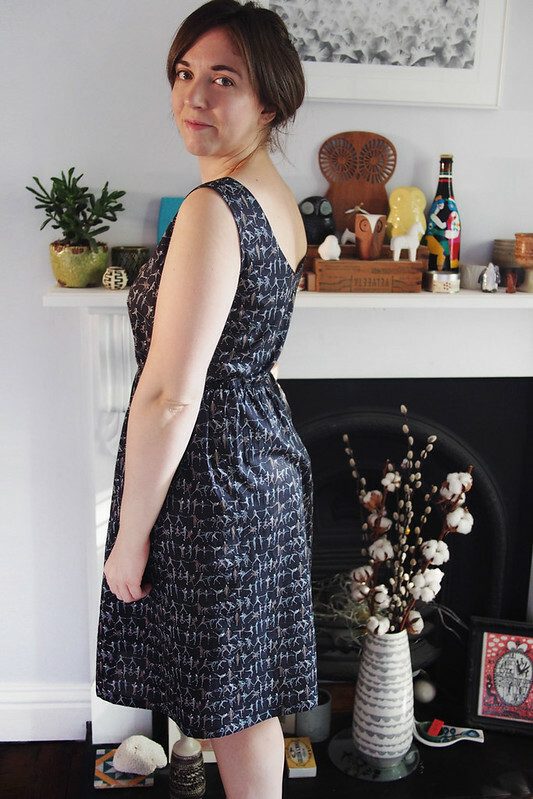 So I made this dress over two evenings and wore it the next day: sewing fast fashion, ha. 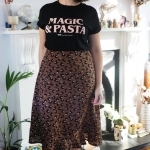 I wasn’t going to blog it since it’s yet another Darling Ranges hack, but then I snapped some photos this morning anyway. I don’t know – is it boring to see basically the same pattern over and over, or interesting to see how little variations can create a new look? 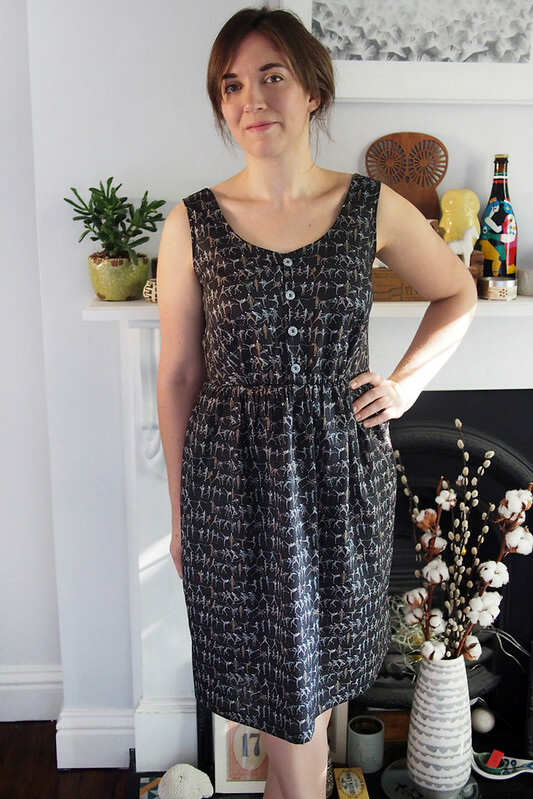 So for this Darling Ranges I used the round-neck alteration, scooping it out a bit more both in depth and width to give skinnier shoulder straps. I simply left off the sleeves, though next time I will nip off half an inch around the armsyces as they’re a bit snug. The edges are all finished with self-bias. Truth be told I only make self bias when I don’t have any suitable ready-made stuff to hand, but it’s really worth it. I scooped out the back neckline, too, for maximum breeziness. The skirt’s a gathered rectangle at my current knee-grazing length preference. The fabric is Liberty tana lawn in Tiny Dancer print, which I got from Plush Addict during a 20% off sale so it was a bargainous £11.60 a metre. Tana lawn is perfect for a heatwave, so light and breathable. It was the first day I felt comfortable all week! The buttons were in my stash and pick out the chalky blue in the print nicely. 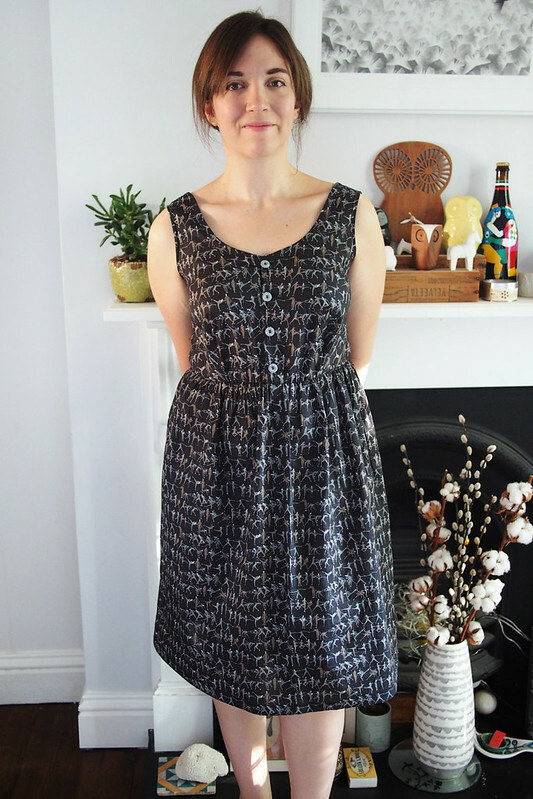 All in all a nice easy to wear, easy to sew frock that should get plenty more wear before summer’s out. It’s great! Enjoy that heat! I’ve had the purple colour way of this in my stash for 2 years, I will absolutely be making something with it this summer! And no, it’s not boring to see repeat makes – I like to keep a record for myself too, to refer back to if I make any changes. I do like to be completist, but that would make my blog REALLY boring! It looks gorgeous and yay for only two nights of sewing! 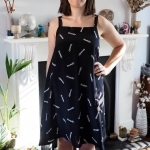 I love your dress out of this adorable print! I have made a Deer and Doe Sureau out of it, and I love to wear it. The lawn surely is wonderful to wear at this hot weather! I just found it on your blog, so pretty! It’s such great fabric – I love when you only see a print detail from up close. definatly not boring. I love seeing all the different versions. This dress is so lovely nice fit and great fabric. Hope you don’t melt! Ooh, I really like that colour way of Tiny Dancer! I’ve always been drawn to the pinky purple version, but the one you’ve used looks lovely too. I don’t think it’s boring at all to see repeat garments, I always enjoy reading about what you’ve made. Hope you manage to stay cool. Not boring at all! It does look really cool and the fabric is so subtle – when you notice what it is, it’s really fun. Yeah, I love a stealthily fun print! I love it, its not boring to see your repeat makes, well for me anyway. Not to buy any more clothes this year but to try and make my needs, I got. Bit stuck this week as I lost my fabric scissors I’ll be whipping up some breezy dresses this weekend though as the monkeys know as my children have now found them! Good luck! I don’t buy clothes very often at all any more. That’s the same, but it’s cheaper on Plush Addict! No I didn’t line it. It’s just about opaque enough to be OK, I’m not really a fan of lining anything though to be honest. This is lovely, I love seeing your makes. So cute! And not boring at all! This is really cute! I really like seeing all the variations that you come up with, so keep the repeats coming! I’ve just listened to the Konmari audiobook, and planning the decluttering for the weekend. However the criteria is very strict/ scary. I mean I’m pretty frugal and I would hate to purchase the same item 3 months later / having to buy a new somthing just becasue I threw out the old one… But very messy, and tend to stash up all type of junk so I need to take actios. Did this method work for you on the long run? 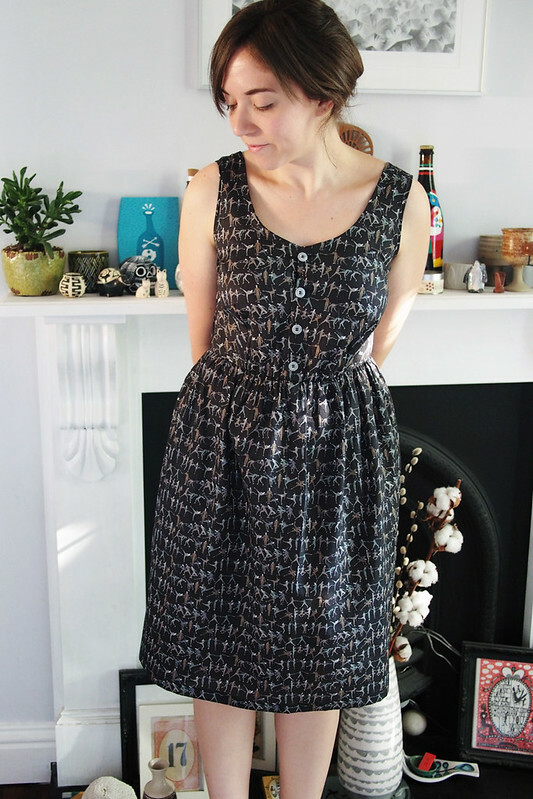 How did you feel when your old frocks could had been handy? Did you regret throwing awy so many things? Did the method make you a tidier person? Hi Viri. Yes, it’s strict. But I don’t miss *anything* I’ve discarded. It’s funny how quickly you forget when you throw, and hence there’s no need to replace anything because they clearly weren’t needed in the first place. Yes, overall it has made me tidier because I appreciate space and having less now. It’s an ongoing process though. Thank you Katie for the encouragment. Yesterday evening I Konmaied my stash, and one of my closets and have filled up 3 ikea bags with my unwanted stuff. I feel incraedibly realifed allready. Let’s see how it goes on the long run. I love this! It’s so pretty! And that print!! !